Jesus’ parables sparked interest among his followers and for generations to come. In this study we’ll explore the reason for parables and also delve into the first of nine parables about the Kingdom at this time in Jesus’ ministry. 5 “The farmer went out to sow his seed. As he sowed, some fell along the road, and it was trampled under foot, and the birds of the sky devoured it. 6 Other seed fell on the rock, and as soon as it grew, it withered away, because it had no moisture. ‘seeing they may not see, and hearing they may not understand.’ 11 Now the parable is this: The seed is the word of God. 12 Those along the road are those who hear, then the devil comes, and takes away the word from their heart, that they may not believe and be saved. 13 Those on the rock are they who, when they hear, receive the word with joy; but these have no root, who believe for a while, then fall away in time of temptation. 14 That which fell among the thorns, these are those who have heard, and as they go on their way they are choked with cares, riches, and pleasures of life, and bring no fruit to maturity. 15 Those in the good ground, these are those who with an honest and good heart, having heard the word, hold it tightly, and produce fruit with perseverance. With whom do I associate most this parable? When I hear Jesus speak what do I think he’s trying to say about the Kingdom? As a disciple, what am I going to do with the truth I just heard in this parable? As disciples constant learners and doers, evangelism, teaching, prepare your heart, repent, love of Christ, first love, seek God, study the Word of God, disciples make disciples. Photo: The reflection on a pond in Orlando, Florida. 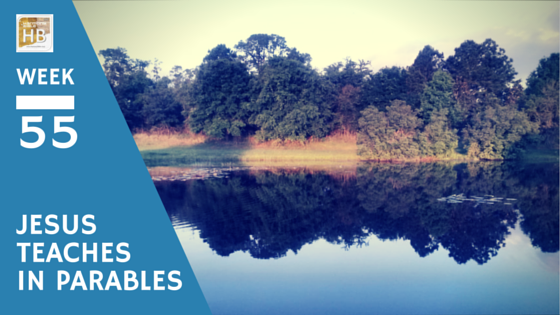 A reflection on the pond, like the use parables, provides us a new perspective on the truth. That day refers to the same day that Jesus delivered the demon possessed man in the Temple (Section 61) and ends after he has shared and explained nine parables with the crowd and his disciples (ending in Section 65). A parallel comes along side the principle lesson as a learning tool to evoke movement of the truth in the heart, mind and life of the hearer. Like the use parables, a reflection on a pond provides us a new perspective on the truth – but the object in the reflection is the real object. Aesop’s fables and stories like Arabian Nights use this same form of teaching truth. Jesus uses this method of teach to both help explain significant truths to people from various walks of life and also to induce deeper learning through inquiry of those who really want to explore Jesus’ teachings and apply it. This set of nine parables all relate to the Kingdom of God. Read also: Galatians 5:22-23; John 15:8. The next verse indicates that there might have been a pause, a break in Jesus’ teaching as vs 3-9 are to the crowd and 10-23 was a message specifically to the disciples. Its as if he came back to the shore where his disciples asked him to explain the nuances of the parable. Marks Gospel record indicates that the disciples and others heard this explanation. Its possible here that Jesus does is not intentionally excluding others but that their choice not to come ask to learn more is an indication that they are not ready to receive the Gospel. Read also: James 1:5;Colossians 1:26-27; 1 Corinthians 13:2. Matthew was intent about explaining the Gospel to the Hebrews. Read: 2 Corinthians 3:14; Romans 11:8-10; Ezekiel 12:2. For this reason Matthew often included Old Testament passages as he explained the Gospel. Scholars offer some minor differences in the count of Old Testament passages in the New Testament but the record is overwhelming and speaks to Jesus and the Apostles effort to communicate the Gospel to Jewish peoples as well as the Gentiles. By one count Matthew includes 36 OT quotes whereas Mark included 20, Luke 18, and John 13. Most people want to experience the life, freedom and power Jesus promised his disciples. So the question is how do we prepare our hearts? How do we help our souls be like the good soil? Every individual will benefit by learning to be open minded, suspend judgment while inquiring more, engage in rational thinking and deeper philosophical thinking rather than rushing to a conclusion or refusing to explore another concept. Read 2 Thessalonians 2:10-11. We can thank God for free will, but we must remember that we also bear it’s weight and responsibility. The next parable recorded by Luke and Mark is similar to a passage in in Matthew 5:13-16, which was sequenced by Thomas and Gundry back in Week 42 | Section 54c. The reason for this is the context of the latter half of Matthews record and the thee Jesus was teaching on at that moment, our Responsibility while waiting for the coming of the Kingdom of God. Marks gospel is characteristically blunt and to the point. The seed (piptō in Matthew, and sporos in Luke) is Jesus who in the Gospel of John is called the Word, the creator, and the incarnate Son of God. How does keeping up with the Jones’ and loving things more than the Lord alter our Christian experience. Read James 1:11-12; 1Tim 6:17. Take the Gospel, set it on a lamp stand so that others can learn from the lesson you have learned. The good news is meant to be shared and you are supposed to take part in the ministry of reconciliation. Read 1Pet 3:15, Acts 4:20; 2Cor 5:11-21; 1 John 1:1-3; 2 Corinthians 9:6.